The Swiss Federal Railways’ special scenic Gotthard train, the William Tell Express, will start operating weekends on April 14 between Luzern and Bellinzona, with service continuing through October. Additional Monday-Friday trains will run from July 3 to October. The train travels over the historic Gotthardbahn line, with its switchbacks and spiral tunnels, providing some fantastic Alpine views. 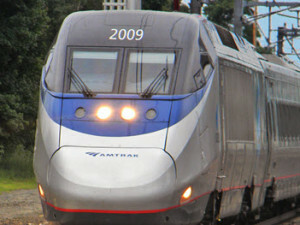 The train carries first class “panoramic” cars plus second class cars, including one car with open windows to assist photographers. The southbound trip starts with a morning boat trip from Luzern across the lake to Fluelen, where you transfer to the train to Bellinzona, with a return trip in the afternoon. You pay a fare supplement of about $24. If you want to avoid paying extra, regular trains will operate as locals over the route every hour. The new service is a result of the new Gotthard Base Tunnel, through which the express Zurich-Milan and Swiss trains bypass the old route. If you have the time, the old route remains one of Europe’s top scenic lines. Check here for my report on taking a trip last year before the new tunnel opened.